NEW YORK (CNNMoney.com) -- In Gary Shteyngart's brilliant new novel "Super Sad Love Story," he envisions a not-so distant nightmarish future for the United States where the dollar has essentially no value and China gets tired of backing our worthless debt. Fortunately, it's just a satire. Or is it? The dollar has sunk like a stone in recent weeks. With the euro now at $1.41, nobody's seriously talking about parity any more. There are growing concerns about the trade deficit in the United States and the possibility of trade and currency wars -- particularly with China. And with the Federal Reserve strongly hinting that a new round of bond buying -- the so-called quantitative easing policy -- is likely to be announced at its next meeting in early November, long-term bond yields could continue to sink. That may put pressure on the dollar and make our nation's biggest creditors, i.e. China and Japan, increasingly wary of holding debt that offers such little in the way of return. So is it time to worry yet about the anemic dollar? Investors in stocks are strongly saying no. As the chart at the top of this column shows, the market has tended to move higher even as the dollar weakens against a basket of major currencies, which includes the euro and the yen. The bet is that the weak dollar is good news for big multinational firms like IBM (IBM, Fortune 500), Coca-Cola (KO, Fortune 500) and McDonald's (MCD, Fortune 500). It should lead to increased demand for U.S.-made goods and services abroad -- particularly in hot emerging markets like China and India. But how long can that last? Several experts said the dollar does have some room to fall further before it becomes a problem. But not that much room. "We're not in a danger zone yet. However, the dollar is rapidly depreciating so the time to worry could come up more quickly than people realize," said Andrew Busch, global currency and public policy strategist with BMO Capital Markets in Chicago. Busch said something has to give soon though. If bond yields continue to fall and the price of gold keeps hitting new record highs, then that's troubling for the dollar. Fred Fraenkel, vice chairman with Beacon Trust Company, an investment firm in Summit, N.J., agreed that the time may be coming where the sluggish greenback does more harm than good for the economy and markets. "Right now, the positive impact the weak dollar has had on exports and multinational earnings has so far overwhelmed the impact of people in the financial world looking for a different place to invest their reserves," he said. "But when you degrade your currency over a long enough period of time, it's a negative for your standing in the world and reserve currency status. That's the big problem that can eventually come back to haunt you," Fraenkel added. Degrade is a strong word. It implies that there is a conscious effort to make the dollar weak. And in some respects, that is what's happening. The Fed is clearly making the decision that it's willing to let the dollar fall a bit more because it thinks a new round of QE could help get the economy back on firmer footing in the short term. The big concern though is that the Fed may be going too far. If the dollar gets so weak that the likes of China and Japan pull out of the U.S. debt market and other nations find that there's no incentive to invest here, then Shteyngart's fiction could become reality. "The dollar had been rallying earlier on a flight to perceived safety," said Anthony Welch, co-manager of The Currency Strategies Fund, a mutual fund specializing in foreign exchange investments in Sarasota, Fla. "Now the behavior of the dollar is a function of our economic policies, which people can argue are not really that sound." The dollar is still about 13% above its all-time low against the euro from two years ago. So it's definitely not panic time yet. But Welch said the Fed can't get too carried away or the dollar could fall to new lows. "We've been here before. But the dollar needs to stabilize around current levels. If it doesn't, there's cause for worry," he said. "I would imagine the Fed doesn't want the dollar to disintegrate and go too low. I hope that's the case." 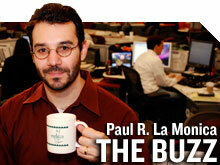 - The opinions expressed in this commentary are solely those of Paul R. La Monica. Other than Time Warner, the parent of CNNMoney.com, and Abbott Laboratories, La Monica does not own positions in any individual stocks. Economy stinks. Why's the market happy?